The images above show the pendulum plates and the mechanism for setting the pendulum in motion. The movie linked to by the image at left illustrates the range of dynamics exhibited by the pendulum. The movie is relatively large (14.5 MB), and runs for some time (3:19). 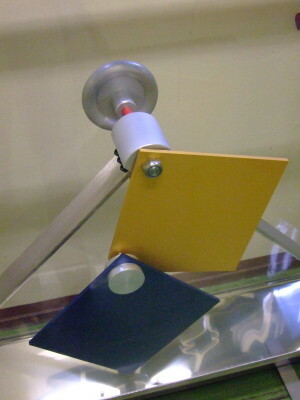 The device is set spinning rapidly, and then slowly loses energy to friction. 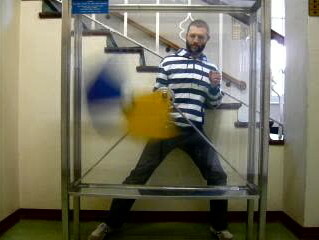 The initial, high energy motion is regular, but once the pendulum loses sufficient energy, chaotic motion sets in (at around 1:23). At lower energies, regular motion returns. The video above illustrates three releases of the pendulum from the upside-down equilibrium position. 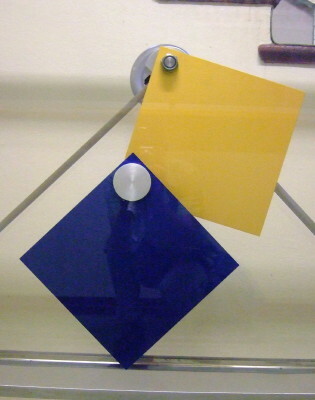 The starting times for the three movies playing in each panel were chosen so that the initial motion of the pendulum is as close as possible in the three cases. However, the motion quickly becomes different in each case, as the movie shows. The motion of the pendulum is expected to be chaotic from this initial configuration, based on the behaviour of the model.